As a German Lutheran, I would like to continue this practice. Each day, starting December 1st thru the 25th, I will be activating a link on the below postcard advent tree. When you click on the link, you will be taken to an antique or vintage Christmas postcard I have listed in my store, Remember When Vintage Postcards. Purchase is nice, but not required. I only ask that you enjoy each Christmas postcard as it is revealed. 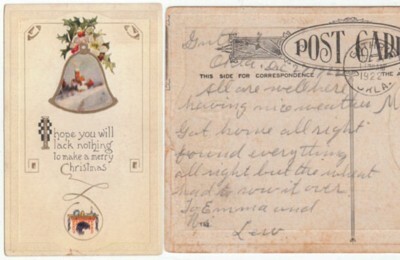 If you want to return to this blog post to reveal the antique or vintage postcards behind the remaining days in December, please click on the bookmark button to the right.